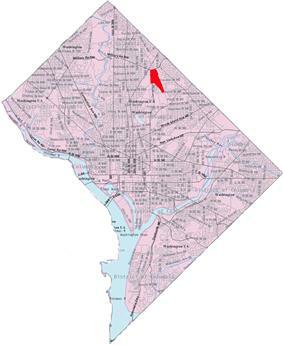 Fort Totten is a park and neighborhood in northeast Washington, D.C.. The neighborhood is bordered by N Capitol St to the west, Riggs Rd NE to the north, the Red Line tracks to the east, and Hawaii Ave NE to the south. It is named after a Civil War-era fort. The Fort Totten Metro station is named for it. All are named for long-time General Joseph Gilbert Totten, the Chief Engineer of the antebellum United States Army. 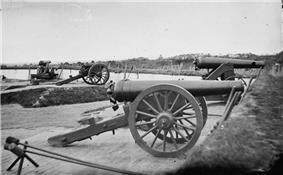 James Rifles at Fort Totten, 1865. Fort Totten was a medium-sized fort, a seven-sided polygon with a perimeter of 270 yards (250 m). It was located atop a ridge along the main road from Washington to Silver Spring, Maryland, about three miles (5 km) north of the Capitol, and a half-mile from the Military Asylum or Soldiers' Home, where President Abraham Lincoln spent his summers while president. The fort was of typical design for its time, with earth walls some 15 feet (4.6 m) thick and 8 feet (2.4 m) high. Outside the walls (or "ramparts") was a large ditch or dry moat over seven feet deep and twelve feet wide, and outside that was a broad cleared area surrounding a barrier of tree branches, brambles and general debris (or abatis). Along the inner surface of the wall were gun platforms for several types of cannon, some firing over the parapet, others firing through openings in it, and a banquette, a kind of shelf on which soldiers could stand to fire over the wall. The earthworks of the main fort are still clearly visible today, including the surrounding ditch, ramparts, and the walls of the 2 magazines within the fort. The smaller Totten Battery, which lies 1000 feet to the North, and the connecting rifle trenches are can be easily seen as well. The park itself is home to a number of picnic benches as well as a Civil War Centennial Plaque marking the main entrance to the remains of the fort.